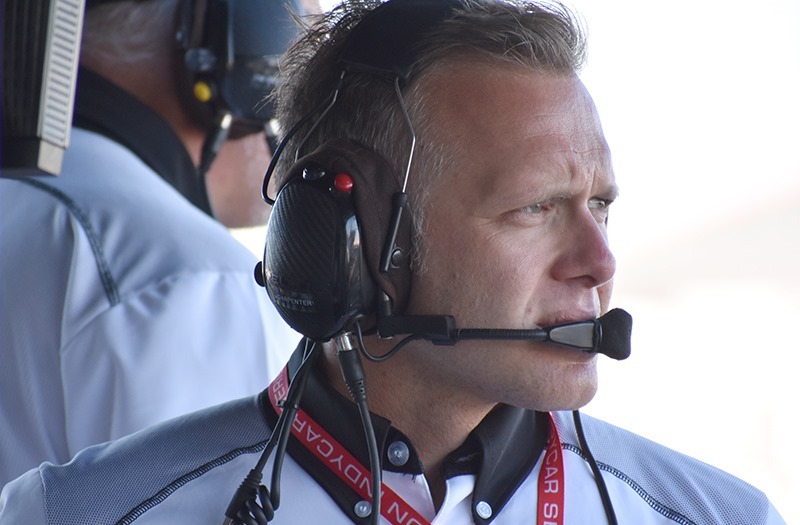 The 2018 Verizon IndyCar Series season has come to a close. 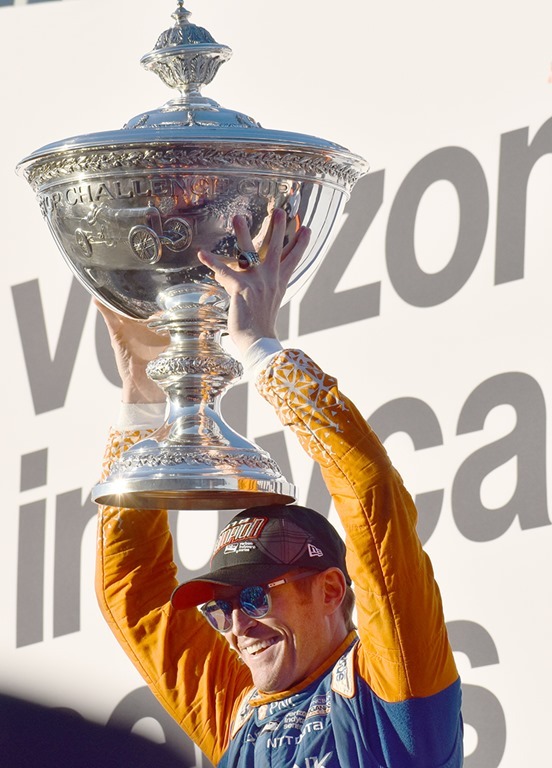 The Grand Prix of Sonoma was billed as The Final Finale, as the IndyCar finale moves down the coast south of San Francisco near Monterey. 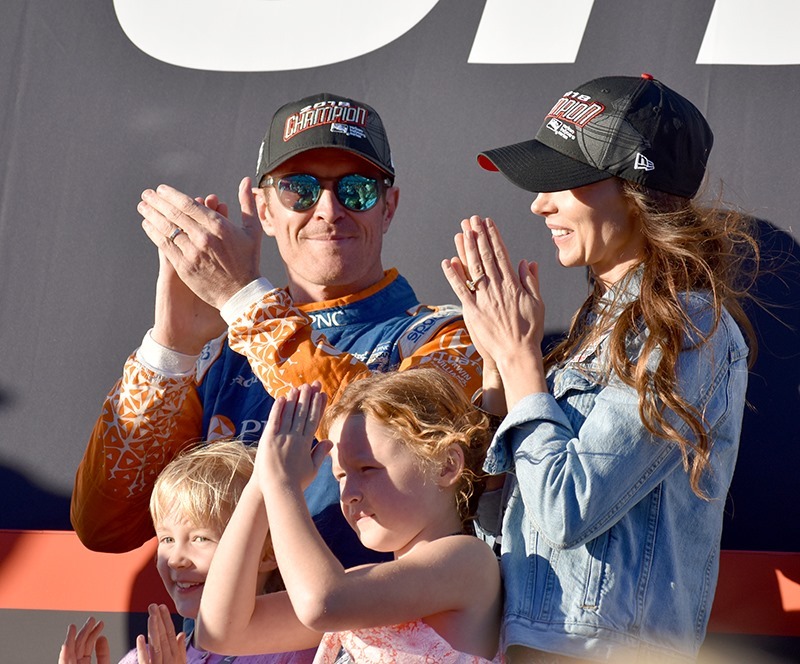 It’s no secret that I have had some unkind things to say about the finale being at Sonoma, over the years – especially with double points being assigned to this race. I’ve also had some harsh words for the race and even the appearance of the facility and the area. My wife Susan will tell you that I don’t easily admit it when I’m wrong – but this one time when I’ll freely admit that I was wrong. I’m still not crazy about the brown grass everywhere, but this whole area is gorgeous. The clear skies and the stark mountain ranges have won me over. I never thought I’d use the word “quaint” to describe California, but this area is scattered with small quaint little towns that all have their own personalities. We are staying through Wednesday and I look forward to exploring other attractions that have nothing to do with racing. Unfortunately, the scenery and the quaintness cannot improve the racing at Sonoma Raceway for Indy cars. I saw a lot of support racing over the weekend that featured lots of passing. I don’t know if these cars are too big, too fast or too closely matched – but there s a reason that this race has earned the nickname Snoroma. If you read my wrap-up last night, you know my position that had it not been for Alexander Rossi charging through the field around the mid-point of the race – this would have been a snoozer. However, Rossi’s drive put a lot of life into an otherwise dull race that saw Ryan Hunter-Reay win pretty much uncontested. 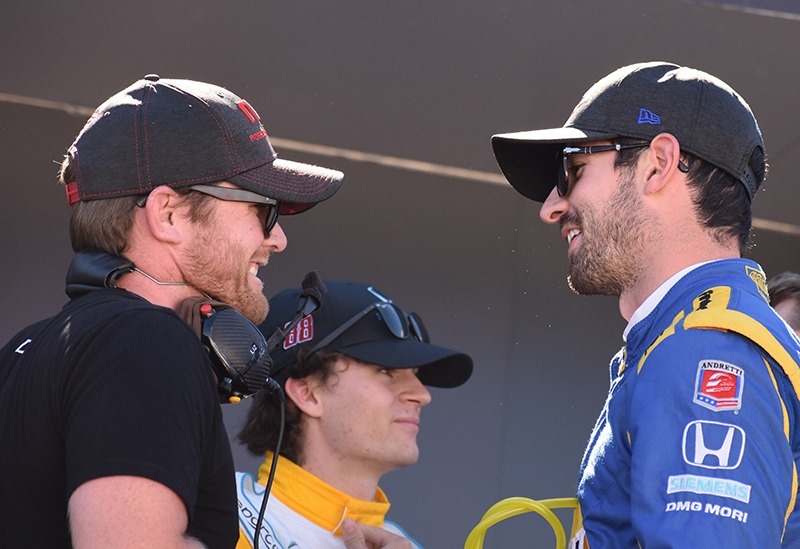 Andretti’s Day: Alexander Rossi running into the back of Marco Andretti was about the only misstep of the weekend for Andretti Autosport. Three of the four Andretti cars qualified in the Fast Six, and the other was in the Top-Ten. They won the race and had three cars in the Top-Seven. The only blemish on their weekend was Rossi not winning the championship. Not bad for a team embroiled in rumors concerning Harding Racing, George Steinbrenner IV, McLaren, Fernando Alonso, Honda and Chevy. Sonoma Raceway: Aside from changing my opinion on this track, one ting that surprised me is how confined the track really is. From watching races at this track over the years, I was always under the impression that it was spread out over a large area. I was surprised to discover that each turn leads to a straightaway that parallels anther straightway right next to it. They just might be separated by a small hill. The track really runs back and forth and you can see almost the entire track from several vantage points. That’s just another example how television can sometimes distort racing events. Surprise Air Show: I was unaware that each year, this track provides an air show to fans about an hour before the race. 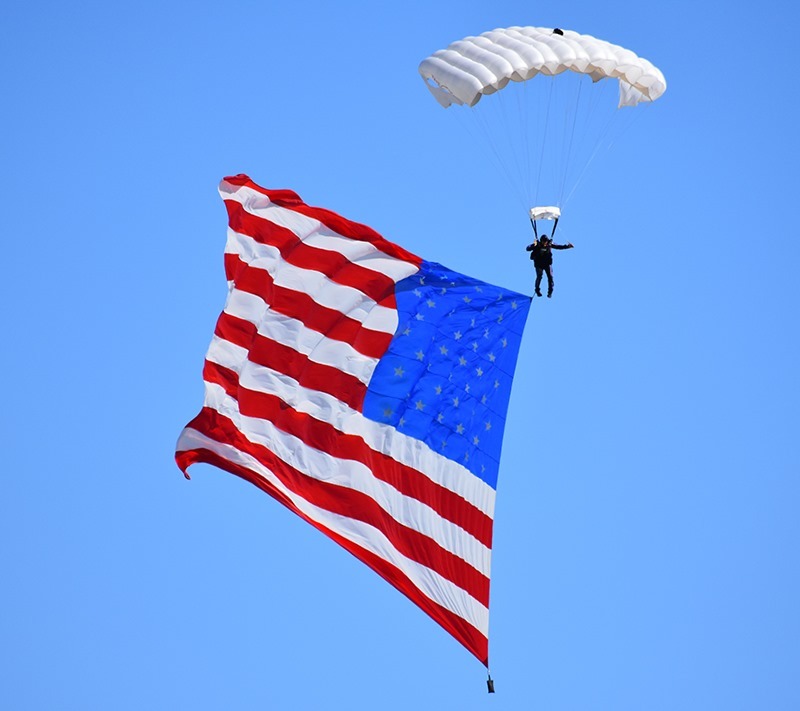 Six jets from a group called the Patriot Jet Team performed aerobatics that were similar but not as sophisticated as the Blue Angels or the Thunderbirds. Still, they performed a few moves that got my attention – especially since I was just below them in harms way, in case something went wrong. Fortunately, the show came off without a hitch. The open sky here provided a good venue for such a show, but this would be a good hook for other tracks to try this. 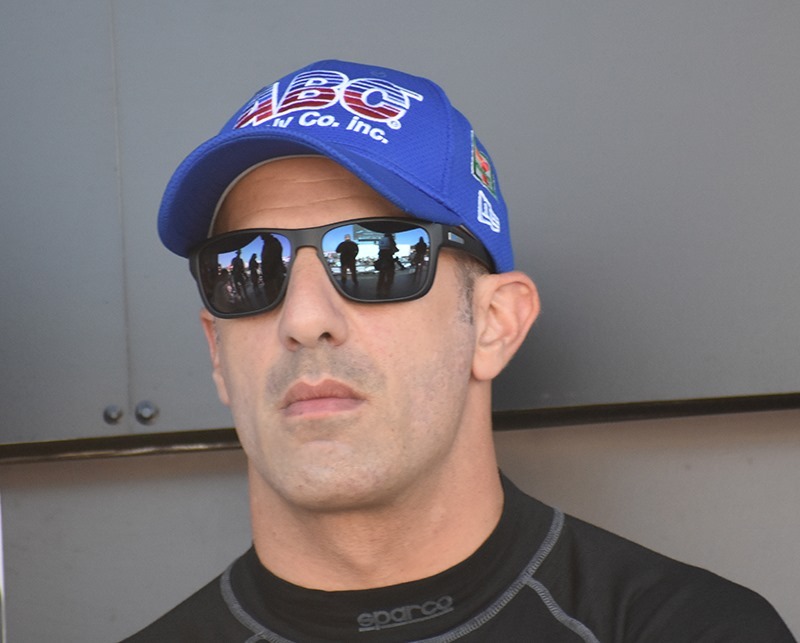 Bad Day for Rahal: It was announced Sunday morning that Takuma Sato would indeed return to Rahal Letterman Lanigan Racing for 2019. That was about the only positive news for the team this weekend. Graham Rahal qualified ninth in missing the Fast Six, and Sato qualified twelfth – dead last in the second round. Sato’s engine let go in a spectacular way on Lap 15, reminiscent of some of the blown engines we saw at Indianapolis in 2017, and he finished last in the race. Rahal had a battery issue that saw him park the car off course on Lap 44. He did go back out several laps down, and finished twenty-third – dropping him to eighth in the final championship standings. 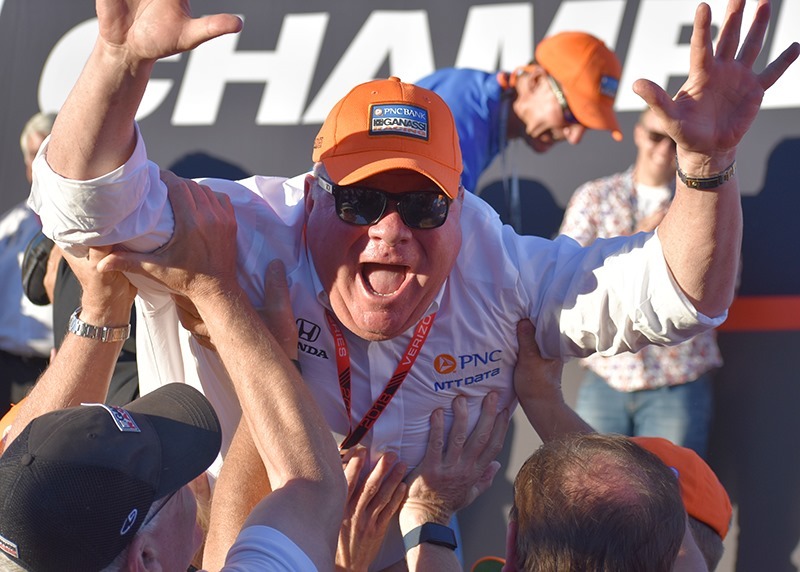 The Next Big Thing: If you weren’t impressed with the job that Patricio (Pato) O’Ward did in his IndyCar debut, you may not appreciate just how hard it is to succeed in this series. When he posted the third quickest time in Friday’s afternoon practice, I think most people considered it a fluke. I’ll admit that I did. 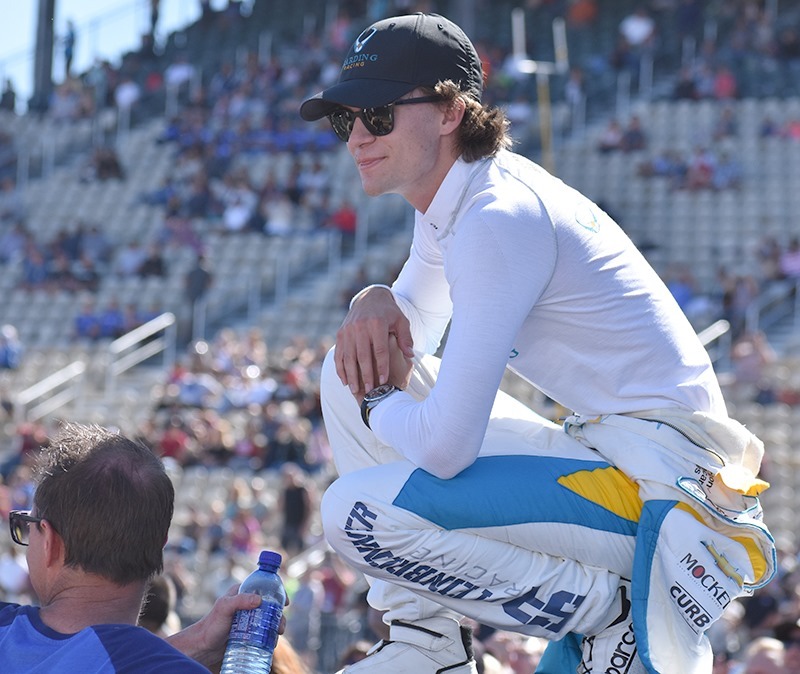 He certainly turned heads on Saturday when the rookie and newly crowned Indy Lights champion made the Fast Six and qualified fifth for the race. Skeptics still thought reality would set n and the rookie would be a back marker for most of the race. There was a period when he was holding up an entire column of cars, but he recovered and gave himself and Harding Racing a very solid ninth place finish. Expect to see O’Ward and Herta in some iteration of Harding called Steinbrenner Harding Racing that is supposedly going to be announced this week at Yankee Stadium. At least that was the unofficial buzz here this weekend. Drive of the Day: As usual, there were several candidates for drive of the day at Sonoma yesterday. 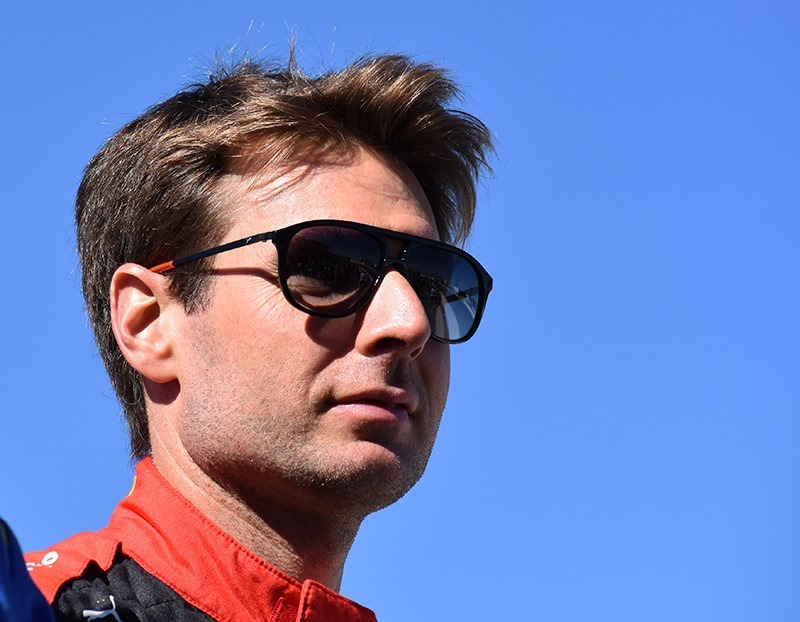 Will Power did not make the Fast Six and started seventh, but he made a strong move on the inside to pass O’Ward in the hairpin and finished third. Santino Ferrucci qualified the third Dale Coyne entry twentieth on the grid. But the rookie drove the distinctive purple car to a solid eleventh place finish. 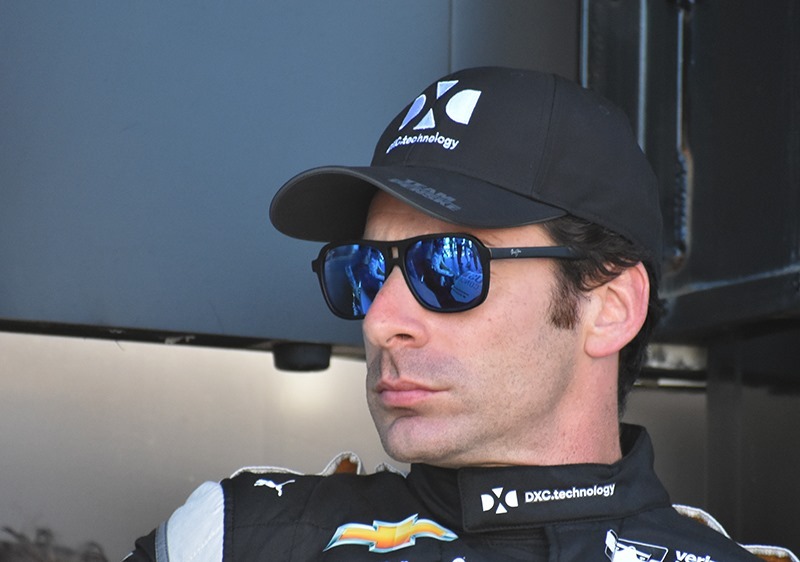 Jordan King also had a great run for Ed Carpenter Racing, after a disastrous qualifying session that saw him qualify twenty-fifth. King rebounded nicely and finished thirteenth yesterday. But to me, the obvious choice for drive of the day is Alexander Rossi. After he suffered wing damage on the opening lap, Rossi got his front wing changed and rejoined the race at the very back of the field. After an opportune yellow on Lap 44, Rossi was able to start carving his way up through the field. He went from last all the way up to fifth, before settling for a seventh place finish. He may not have won the championship, but Rossi did have the drive of the day. All in all: Had it not been for Rossi’s passing clinic in the middle section of the race, this would have been a very boring race – and that’s from someone who was in attendance in the pits when I got to experience shiny race cars whizzing by. It probably would have been even more boring watching on television. But other than the potentially boring race saved by Rossi – this was a perfect weekend. The weather could not have been better, although the late start made it very cold by the end of the race if you were standing in the shade like we were. But as I said earlier, we have really taken to this area and the folks at the track could not have been nicer. The drivers all lamented the fact that the series was leaving Sonoma and I don’t think that was just lip service. They seemed genuinely upset that this was the last race at this track that is very impressive in person. Next week we’ll turn our attention to the offseason and begin the annual speculation about next season. With all the possibilities of new teams, this promises to be a very entertaining offseason. I’ll close by thanking everyone that followed us this past weekend at Sonoma and all through the season. But remember, this site does not go on hiatus during the offseason. I’ll be here regularly every Monday, Wednesday and Friday – except for the times that I take a few breaks – like this Wednesday. 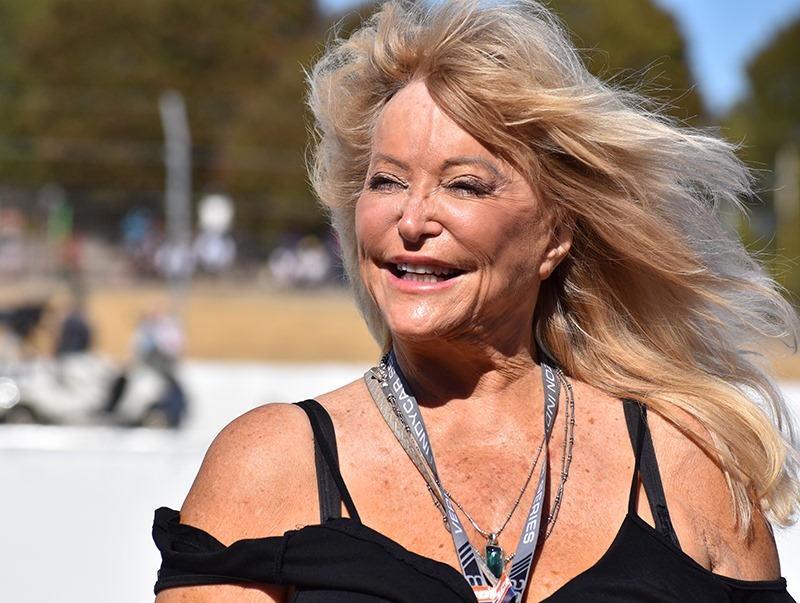 Please enjoy the following photos that Susan took while we were here at the track this weekend – including the famous Miss Linda Vaughn and Chip Ganassi crowd surfing. This entry was posted on September 17, 2018 at 4:02 am and is filed under IndyCar. You can follow any responses to this entry through the RSS 2.0 feed. You can leave a response, or trackback from your own site. I didn’t answer the poll because there wasn’t a third choice. From your observations it’s easy to understand why sponsors like the finale in Sonoma, but not sure it’s the best place for an exciting final race. Sounds like Laguna Seca won’t be either. Happy for the sponsors though. Have a good time in the Bay Area George. What a turd of a race! Other than Rossi’s charge, this was one of the worst I have seen! Indycar has to do better, this is why they got bumped for NASCAR! People were having a fit about that, well, like it or not, the NASCAR race actually had passing! Anyone throwing a fit about getting bumped is eating crow this morning. And anyone who watches NASCAR and decided to be a first-time Indycar watcher isn’t tuning back in! Sorry I am being so vocal but that was a very sad race. Double points make no sense, Dixon was going to run 2nd all day no matter how many points were on the table. Not satisfied with the race or the championship this year as I really felt like Dixon was dull all season but that’s what it takes. He’s not human! I hope we get a better fight for it next year and the contenders decide to stop taking themselves out of it. None of this matters though because we saw Wickens yesterday moving a bit and talking, it was the best thing I have seen in a long time. He has a tough road but it was great to see him! That made this a great day! C’mon now, the Indycar broadcast was bumped to CNBC because NASCAR has more viewers, a TV contract worth a lot more money, and probably a contract clause stipulating when NBC can end a race broadcast. The quality of the racing action had no bearing at all on NBC’s decision. 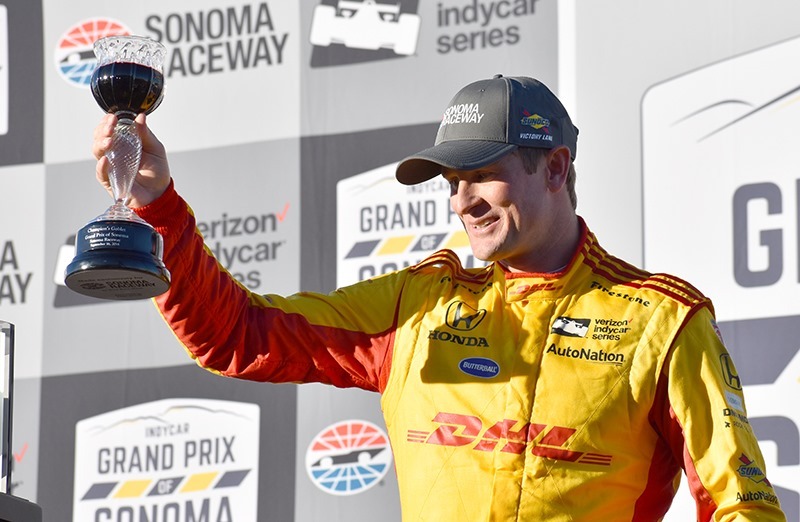 I was reference more that Indycar has taken a backseat to NASCAR because of factors including so many of these dull races like we saw at Sonoma. There was a time long ago that I am not so sure we would have seen them get bumped in this fashion. This quality of racing has helped to erode the series to a step-child of NASCAR. OMG! Linda Vaughn. 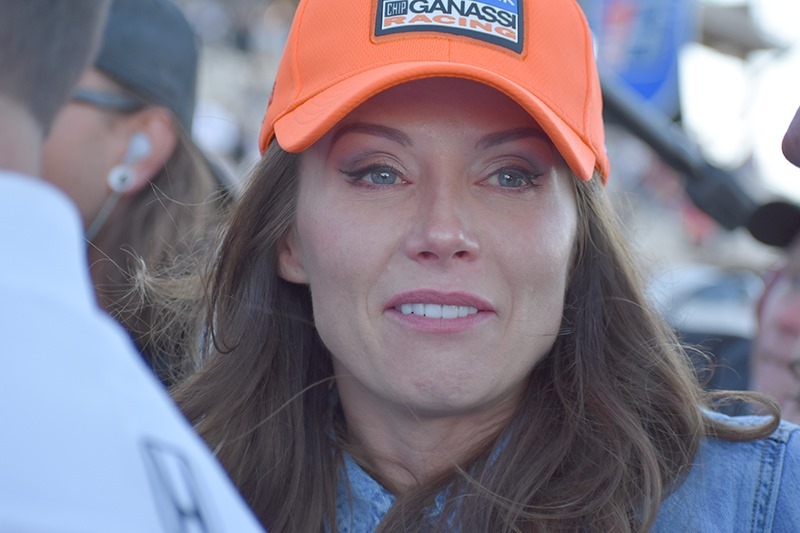 The first lady of motorsports. Miss Hurst shifter. She is all over my collection of hot rod magazines and all over the hot rods. 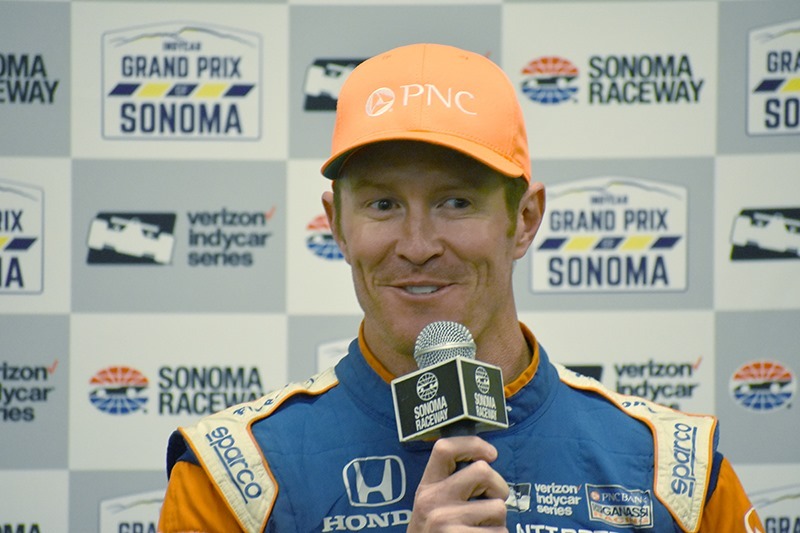 Unlike the Debbie Downer here, I loved this race simply because Scott Dixon won the title because he earned it. Per usual Rossi shot himself in the foot. While Dixon may seem dull to one commenter here, winning is not dull. His racing skills are such that he doesn’t have to be “carving his way through the field” all the time. There were lots of Mexican media folks there covering Pato O’Ward. Great pictures Susan. Thank you. IMO it is definitely worth mentioning here that there were two women engineers on Dixons car……..Assistant Engineer Kate Gundlach and Data Engineer Danielle Shephard. You go girls! Kate was on Simona’s team in 2012 with the pathetic Lotus. Glad she got an opportunity with a top team. Still hope Simona gets a chance like that someday. Wouldn’t that be wonderful. I miss Simona and hope she is doing well. It sounds like Simona is being well paid in Supercars but with not very good results so far. Her open wheel experience doesn’t transfer to those cars. She has basicly had to start her career all over again. The competition is tough and there’s not much practice or testing. She’s not with one of the better teams either. With all the talk of more IndyCar seats in the near future I hope she is making some phone calls. I hope so too, Patrick. 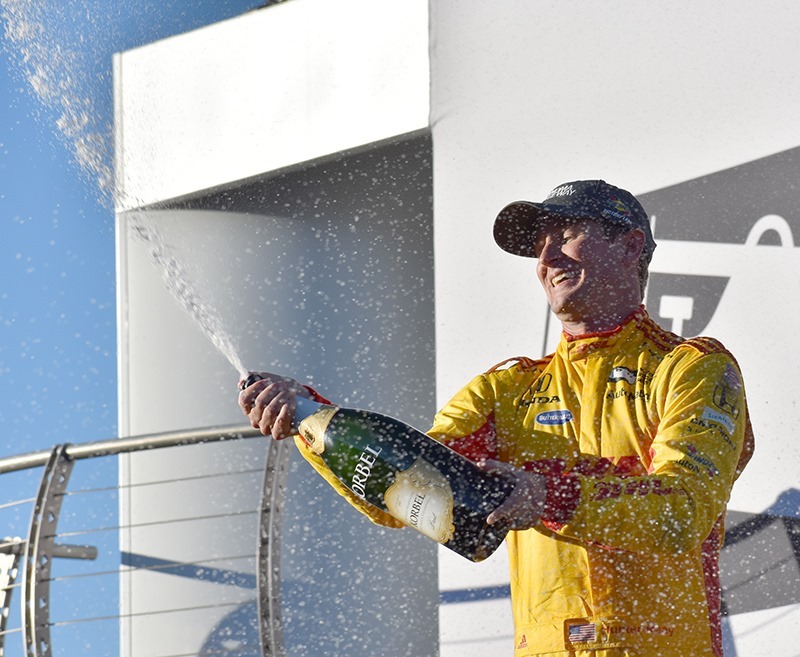 I am pretty much always pleased to see Hunter-Reay win a race. I’m not an RHR fanatic, but his career path is so incredibly interesting that I cannot help but root for him to succeed. 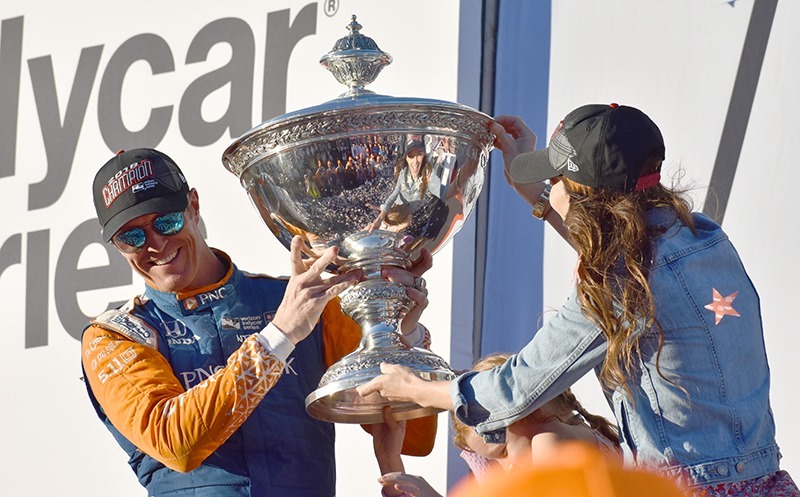 His career has been an old school kind, paying dues in bad rides and navigating the quicksand of rising and falling racing teams that aren’t owned by Roger Penske. Seeing him in a steady ride and on the top step of the podium feels, fairly or not, more “hard-earned” than it does with most other drivers. Here’s hoping we’ll see it again more than a few times before he retires. George, great post and glad you enjoyed yourself. I’ve been to every IndyCar event at Sonoma and will be sad to see it go. Ironically, I think this was the best crowd for an IndyCar race at Sonoma in a long time. There was no drama at the front of the race, but we were on the edge of our seats, first as Rossi ran into trouble and sliced his way back, and later, we wondered if Dixon could hold station. There were plenty of great dices back in the field, and the crowd cheered every time Rossi moved up. The crowd knew what was at stake. There is a notion that a race must have passes for the lead to be exciting or worth watching. Not so; here, the stakes were huge and the tension was palpable. 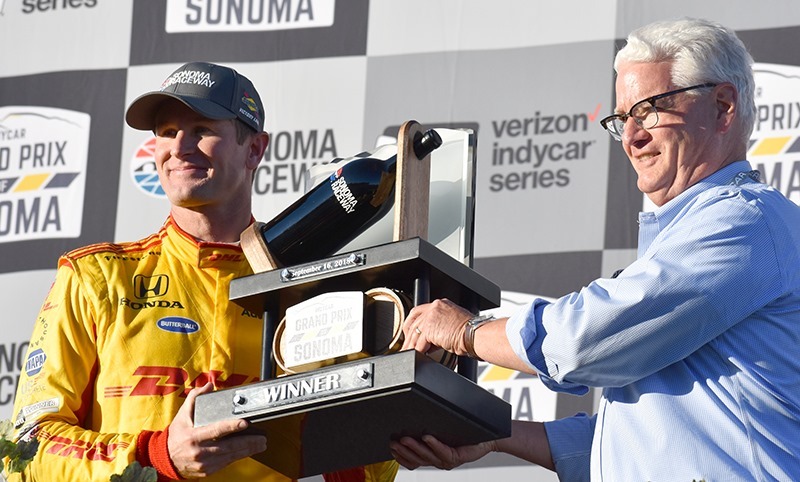 Sonoma has been much maligned by IndyCar fans, almost from the beginning of the event. 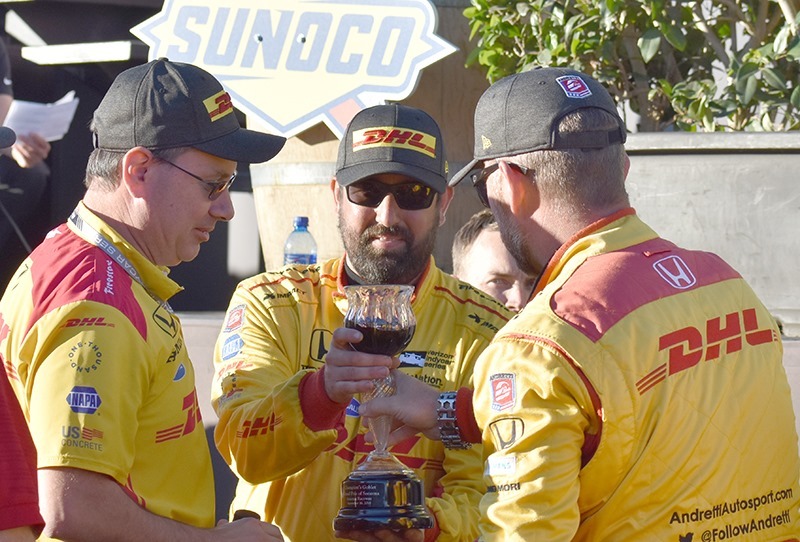 While the old guard clamors for a return to places like Phoenix, which did not pan out, Sonoma was consistently treated like a drab choice that no one wanted. It’s actually disheartening as a fan to spend your money every year to attend the race, and then watch as comment after comment trashes the race, the circuit, and the scenery. Usually, these views are shared by people who have never been to Sonoma and so cannot really speak to any experience beyond the broadcast (and who don’t pay the water bill in an arid climate that is dry from May to October). The broadcast misses so much of what is going on behind the leader, it’s almost sad. But we were watching it, and given the narrowness of the site, as you mentioned, we have a clear view of the front straight, the carousel exit, and turns 7, 8 and 9a-b. The folks at SMI have always tried to make the weekend a fun event, and they succeeded, even when the series may not have been pulling its weight (the fan village was a lot of fun, sadly gone). Laguna, like Phoenix, resonates with the old guard, but makes little sense for the future (i.e., why are you moving the sport out of the heart of the six million who live in the Bay Area, to a circuit that’s two hours south (if you hit traffic right). IndyCar has not been to Laguna Seca in nearly two decades; let us hope the experiment pays off. As a Californian I am always amused, but am tired of hearing people from elsewhere complain about the scenery. I think it is beautiful! We do not have the amount of rain nor humidity as other parts of the country. If you must have green come in spring unless we are having a drought. Then it is a toss up. Portland is the same, especially this year. We would rather have drinking water than green grass. Sorry George, just had to vent. I agree with you. Luckily the race was re-broadcast this morning and it looks like I will now be able to see the start. I gather there was no pre-race show? 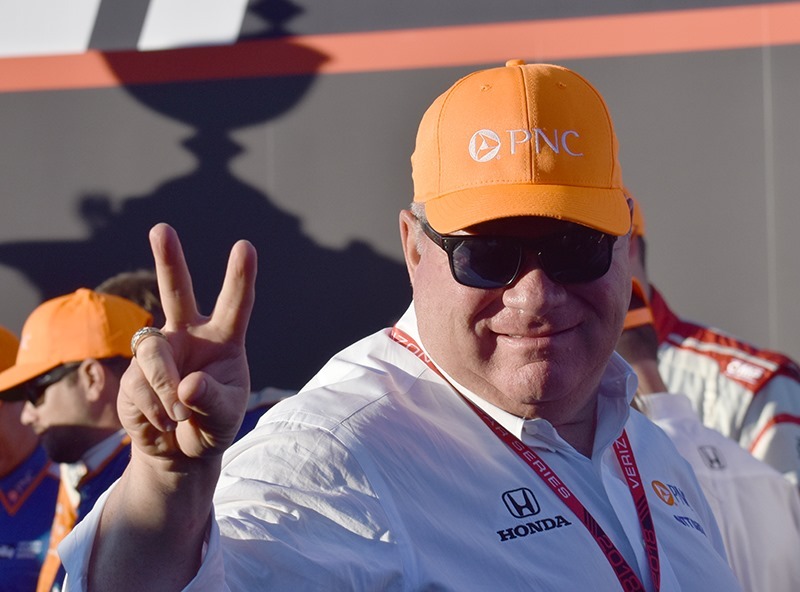 George and Susan, thank you so much for another wonderful season of IndyCar news, stories, and chatter. 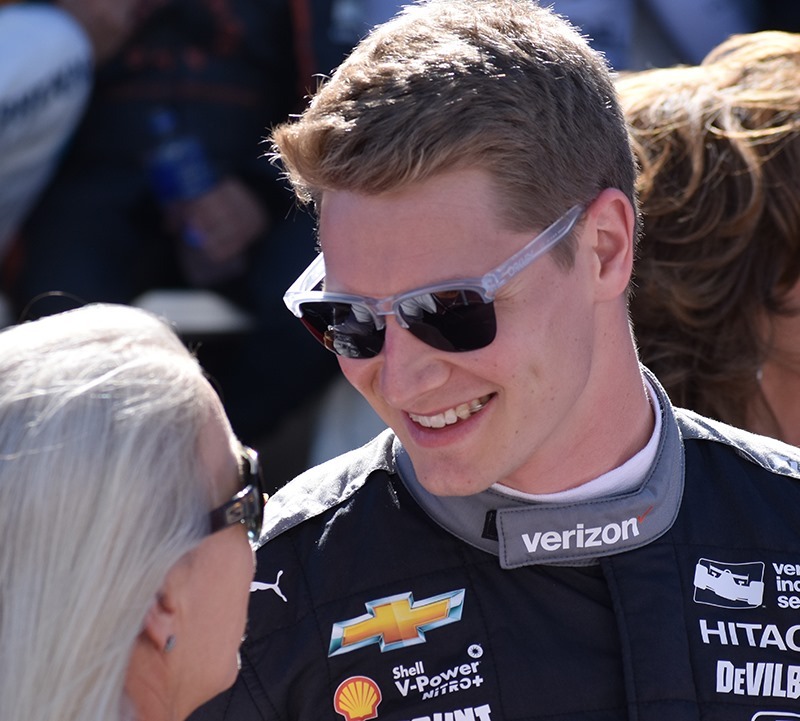 Coming here to read your thoughts has become one of my favorite parts of the IndyCar season, and reading your stories during the off-season is just as great. We really appreciate all your hard work and your passion for the sport and love hearing your stories about the old days of IndyCar racing. It’s very refreshing to have your unique perspective instead of all the other news sites that just rehash the same PR-friendly stories, and that’s why OilPressure is always my first stop of the day. George I was wondering why there was such a disaparity in performance between Pato O’ward and Colton Herta in Sonoma when essentially Colton was out qualifying Pato on Indy Lights and usuallly something would go wrong during the race and Pato would take advantage of Colton’s problems. I was just a little bit disturbed that everyone was playing up Pato’s performance as the next big thing when I think Colton is equally talented. Well this article sheds light on why Pato was so much better. Essentially Pato’s car was prepared by Andretti and Colton’s car was Harding’s original and prepared by them, therefore the big performance difference. I just sometimes feel that everyone quickly jumps on a band wagon to play up one particular individual more than other one and never presents that balanced view, this happens in life and in this case as well before looking into the details. Check out below.